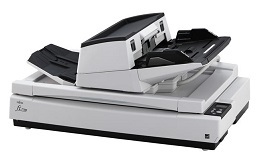 These new A3 models are tailored specially for heavy-duty professional users, such as those in government, financial institutions, healthcare, and service bureau", said Senior Vice President, Nishida Fujio, PFU Asia Pacific Pte Ltd. "We aim to improve work efficiency in the back office with high scanner capabilities. The fi-7700 and fi-7700 are equipped with scanning speed of 100 ppm / 200 ipm (A4 landscape, color, 200/300 dpi), large paper chute capacity up to 300 sheets, and flexible paper handling from thin paper to plastic cards, books, magazines, envelopes and long paper. The straight paper path structure that reduces the load on a document that is being fed, assures stable scanning regardless of the condition and type of a document. In addition, the Paper Picking Control function observes each document's movement, and controls the pressure put on the papers that are set on the chute, making smooth continuous feeding possible. Moreover, by simply changing the feed mode to Manual/Single mode, you can easily scan thick documents such as drawings folded in half, multi-layered receipts, and envelopes with the same straight paper path operation. The scanner is equipped with an ADF that can slide to the right or to the left or rotate by 180 degrees. User can load documents easily for scanning by adjusting the ADF to suit the user's office or workspace environment. Operational panel is equipped with an LCD screen to let user easily check the status of the scanner. You can focus on routine tasks (batch scanning) and configure the scanner to create folders that are divided with barcodes or patch codes as well as automatically sort scanned images to save or index them. The automatic selection of a scanning mode according to each patch code allows you to load a mixed batch of documents with different types of documents at the same time. The usability for administrators and users is taken into consideration for image processing, which has made simple operations possible and has improved productivity, so that less work is required for users to sort scanned images. Physical dimensions 27.8" x 19.7" x 13.6"
ADF Feeder Paper Size Min. - W x L 2" x 2.72"
ADF Feeder Paper Size Max. - W x L 12" x 220"
Copyright © 2017 Wholesale Scanners Inc. All rights reserved.